SurfART.com is a high-end, fine art collection celebrating island lifestyle, ocean heritage, and surfing. 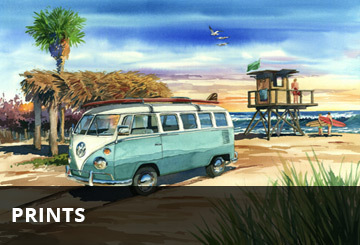 One of the largest online galleries of its kind SurfART.com features more than 700 images. We have been honoring the surfing and island lifestyle through artwork for over 25 years. Not only can you purchase art directly from artists and publishers, but you will get to know the artist through their personal biographies. You will love learning about the artists’ roots of surfing and the island lifestyles they live. The SurfART Gallery started in Oceanside, California in 1987. Celebrating the surfing heritage and island lifestyles through artwork. SurfART.com welcomes you to the incredible visuals only possible in the ocean heritage. We encourage you to explore all of the art styles and genres from each of our artists. Our artists have diverse portfolios filled with various forms of art they have produced and made available to you. They will amaze you with their signature prints, originals, surf photography, and limited editions. We add NEW ART almost daily and encourage other SurfART artists to submit their portfolio's for possible representation. You don’t need to hang ten to enjoy the beautiful sights and scenes of a our island lifestyle, but being able to hang an authentic original or limited edition would sure come in handy. *SurfART was founded by Tom Glenn in 1987. Steve McKibben is our CEO & Curator.